John Lewis is investing £500million in its online shopping service as it aims for internet sales to overtake those in shops within just four years. The department store chain has embarked on an investment programme to be completed by the end of 2018 which will add hundreds of recruits to its IT department as online demand for products continues to soar. 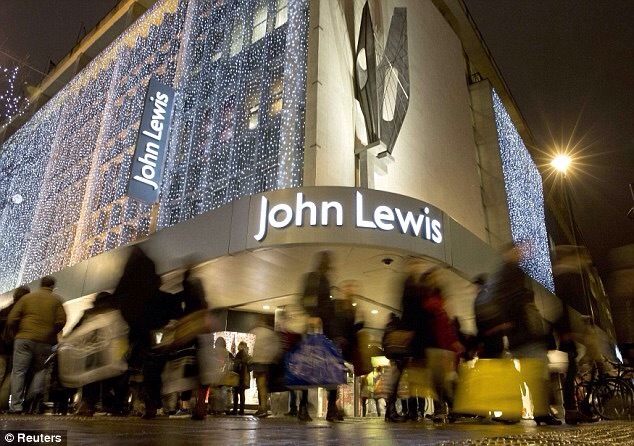 Internet sales at John Lewis rose 13.6 per cent in the week to December 5 compared with the same period last year. Managing director Andy Street expects internet sales to overtake store sales in 2019 – a year ahead of his original forecast. Total sales at John Lewis last year were £4.1billion. Street said of the change in forecasts: ‘This has not blown our assumptions out of the water – but it has moved them forward. The investment plan, the bulk of which will be executed in the next three years, will include the completion of state-of-the-art warehousing and investment into information technology that will improve systems, forward planning, analysis of shoppers and their buying habits and provide what Street called a ‘seamless journey’ for customers. ‘This is about the systems that link everything from buying right through to the end point of the customer at home on their keyboard,’ said Street. The company has already invested almost £280million in a two million square foot distribution hub that will become fully operational next year. ‘We have increased our investment in IT sixfold over the last six years and the number of people involved has increased three times. This is a story about how retail has changed given how the customer is now shopping,’ he said. He estimated that more than 500 IT professionals would be recruited to work in the company’s head office in London’s Victoria, and through overseas contractors by the end of the programme. That would take the total employed in IT to more than 2,000. The firm’s distribution hub in Milton Keynes currently sends out as many as 400,000 orders a day and there are plans for everything bought on the internet by 2020 to be delivered from one massive facility in a central location. Posted on December 14, 2015, in #retail, #uk. Bookmark the permalink. Leave a comment.